When blinding sun strikes alpine snow in British Columbia backcountry, the enthusiasts strapping on high-end ski goggles will describe the mood as transcendent. Until, of course, they chopper up to the very top, where the euphoria kicks up yet another notch. "I liken it to the sensation of flying,'' said Tom Jackson, who's been heli-skiing for the past 15 years. At thousands of feet in elevation, it becomes the mountain guide's job not to let that elation get to people's heads. Because missteps frequently have lead to deadly avalanches. Three people have died in avalanches so far this winter season, including a heli-skier near Revelstoke, in southeastern B.C., who was the second person killed in the outdoors over two days last week. Thrill-seekers will pay $1,000 to $1,500 per day in Canada for the insatiable rush of carving up uncharted territory, while taking in sensational views. But like anything with great reward, it comes with undeniable risk. Keith Reid, a world-class B.C. mountain guide and president of the Canadian association that regulates the profession, said that risk can never be mitigated completely. But he said more can be done. "Either people aren't looking at (the avalanche warnings) or they're not translating that into the terrain that they're going into, or, in general, they're just super enthusiastic and can't hold themselves back,'' said Reid, 50. A good guide is able to show tourists a great time in the wilderness by using superior technical knowledge and snow science. But the guide must also have the backbone not to bow under pressure from clients who have paid the big bucks for exhilaration. "The better part of the incidents that occur ... are very often the guests that differ off of the guide's line, lured by something slightly steeper or a slightly different aspect,'' Reid said. 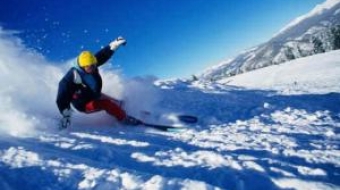 Elevating safety on the slopes in most cases comes down to the guide's professional judgment. Certified guides have at least a dozen training courses under their belts that take a minimum of four years to complete, and they only qualify for the program after years of high-end recreational experience. "People, a large percentage of the time, want to ski something bigger and steeper,'' Reid said. "What makes one guide better than another ... is for those guests to feel completely confident in a guide's decision-making and not pressure them to ski more challenging things. Every year in the province, an average of 14 people are killed by avalanches. The deaths usually occur when people are skiing or snowmobiling, and frequently, those snowslides are human-triggered. Greg Sheardown, a Canadian expatriate living in Dubai, was pulled from beneath a snow pile that swept him and three others up while on a tour with Canadian Mountain Holidays on Dec. 30. The 45-year-old business executive was one of only a few experienced heli-skiiers who have died on the peaks they love over the past three years. But in recent days, there have been repeated other reports of skiers' near-misses with tumbling snow. The science behind avalanche prediction is constantly improving, along with high-tech safety gear such as avalanche beacons and inflatable backpacks worn by skiers to help them survive a slide. Mountain guides, who are self-regulated through Reid's association or a similar Swiss outfit, are employed by the 20 or so heli-ski operations that transport guests to about 40 locations across B.C. Industry figures estimate 90 per cent of global heli-skiing takes place in the province. "The guides are very cautious about where they ski and they go to great lengths to investigate their own local terrain and they communicate daily with all the other operators about the avalanche hazard, what exposure, what they've seen,'' said Jackson, who runs the travel agency heliski.com. Some 77 people have been killed since 1974 in heli-skiing or cat-skiing incidents in B.C., according to the Canadian Avalanche Centre incident report database. The hardest thing about skiing in Whistler is leaving. 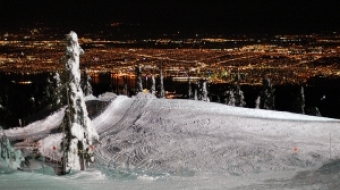 West Vancouver's Cypress mountain shimmers on the horizon nightly, offering one thing Whistler doesn't: late hours and excellent night skiing and boarding. Skiing as a beginner on the Grouse is a thrilling experience.